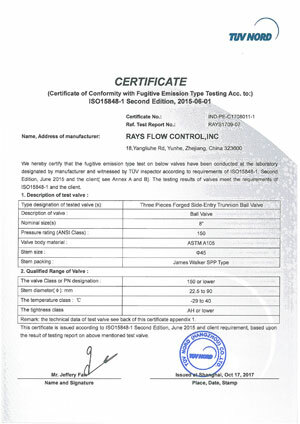 RAYS flow Control is pleased to announce that it has been awarded Certificate of Conformity with Fugitive Emission Type Testing (Class A) Acc. to: ISO15848-1 Second Edition. RAYS scheduled to conduct and successfully passed the audit in our own laboratory in RAYS factory on Sep. 25th-26th, 2017, which witnessed by TÜV inspector according to requirements of ISO15848-1. The testing results of valves meet the requirements of ISO15848-1 and the client. ISO 15848 specifies testing procedures, for evaluation of external leakage of valve stem seals and body joints of isolating valves and control valves intended for application in volatile air pollutants and hazardous fluids. Valves are the indispensable equipment, which is one of the main leakage sources in the petrochemical plant. With the increasing awareness of people’s safety and environmental protection, it is more and more stringent to permit the leakage level of poisonous and combustible explosive media in petrochemical plant. Therefore, the leakage of such natural gas purification facilities has more stringent requirements, the use of low leakage valves will be more practical significance.